Grand Central Transforming & Expanding Table | OhGizmo! We’re fans of anything that transforms as long as Michael Bay isn’t somehow attached, so this Grand Central table, conceptualized by Sanna Lindström and Sigrid Strömgren, is ok by us! Inspired by a pop-up map of New York, the table top is divided into 22 pieces that allows it to be opened up and used as full-sized round coffee table, or collapsed into a considerably smaller footprint and used as an end table. 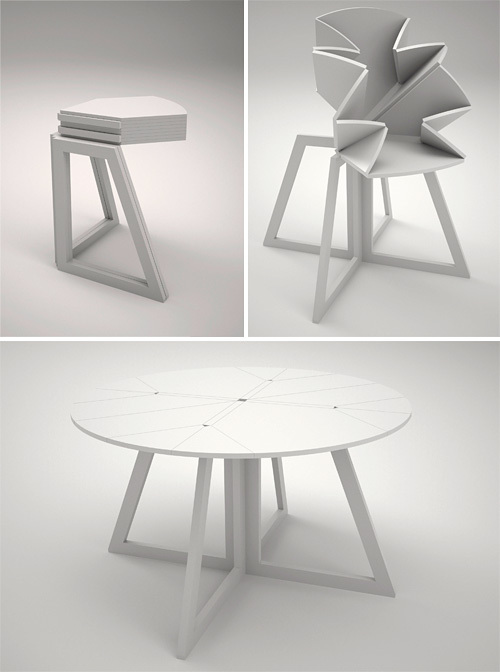 And even though the photos used here appear to be renders, an actual working prototype of the table does exist and has been shown at various exhibits in and around Europe. It’s just unfortunately not available for sale.